Excel Database Report Builder is a special tool that allows you to build reports in Microsoft Excel format from any database. You can build your report using several sources in different formats. It is frequently the case that in different branches of the same corporation different database software is used. 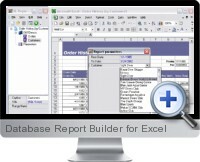 There is no other easy way to generate a report from different data sources but to use Excel Database Report Builder.